The second biggest day in the life of a cadet at Royal Military College of Canada is the day they receive their military college badge. The number one day, of course, is graduation day close to four years later. For some a little longer. This past saturday the big day arrived – the obstacle course was already history. In front of a large crowd likely in the 1200 – 1500 size the Class of 2021 marched on to the parade square led by the First Year Orientation Period I/C, OCdt Annie Mercier from Kapuskasing, Ontario. OCdt Mercier and her entire FYOP team have much to be proud of as the 2021 group looked pretty confident and impressive. The weather was iffy from the start. When the sun was out – which was most of the time during the two hour and ten minute ceremony it was pleasant. However, when it was cloudy it was a Fall-like cool – but bearable. – The Royal Military College of Canada Club President, 9143 Captain (Ret’d) Bruce McAlpine. The majority of the first years were presented their cap badge by members of the Old Brigade symbolizing their full integration into the Cadet Wing. A few exceptions took place when Ex Cadets – who happened to be a parent, uncle or close relative had the honour of making the presentation. All in all, a special moment on the parade square. 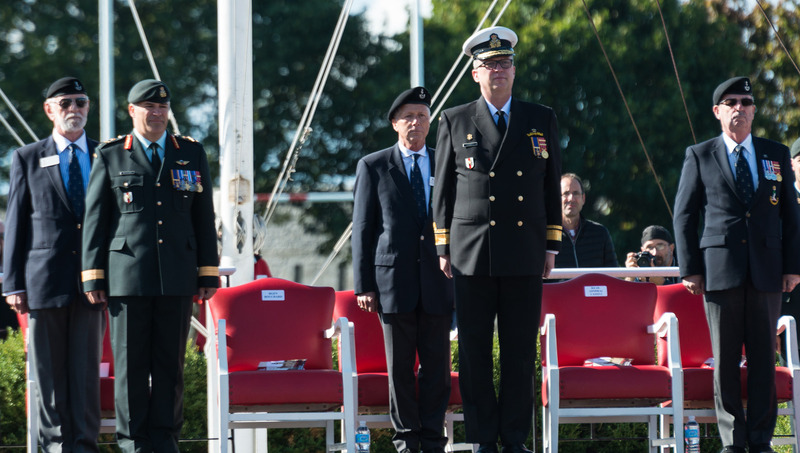 Three well delivered speeches were given: Rear-Admiral Luc Cassivi; le Brigadier-général Sebastien Bouchard; and Bruce McAlpine. The sight of watching a ‘rook class’ join their respective squadrons, as members of the Cadet Wing is a special moment. Looking closely in the eyes of many of the Ex Cadets in attendance, one has to wonder what is going through their minds at the time. We wish all members of the Class of 2021 much success in their personal life and professional careers moving forward. This Saturday, the Class of 2021 completed FYOP and marched in the Badging Parade, which represented their full integration into the Cadet Wing. The parade began bright and early with the marching on of the Cadet Wing a little after 1000. Dressed in their pristine scarlet uniforms, the Cadet Wing’s drill was sharp and impressed the excited audience. The amount of effort put into practicing for this parade was evident. After the wing officer positions fell in and arrival of the academic wing and dias party, the morning’s main attraction, the Class of 2021, marched on, wearing their blue Number 4 uniforms (commonly known as 4s). The highlights of the parade included the awards ceremony and the actual badging. During the awards ceremony, OCdts from all years were recognized for their achievement in the four pillars (bilingualism, academics, leadership and athleticism). A member from each FYOP flight is also presented an award for outstanding leadership. Of course, the most important part of the parade is the actual badging ceremony. 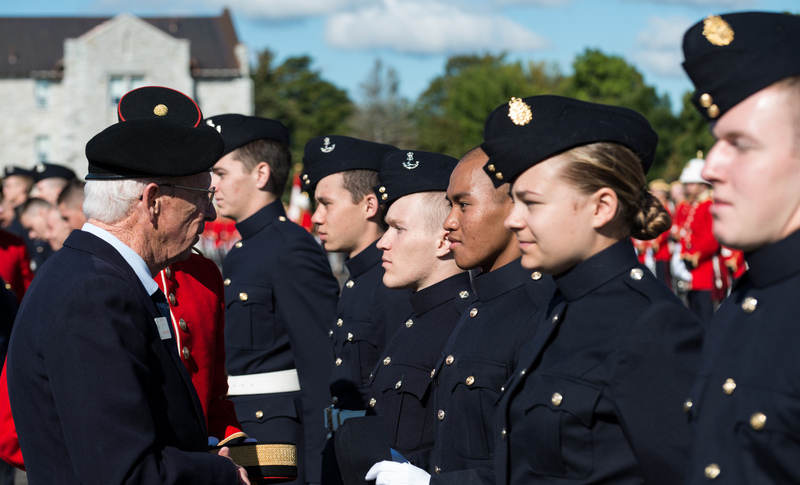 When cadets arrive at the College, they wear the Canadian Forces tri-service cap badge, which signifies their completion of part of basic training. During the badging ceremony, a member of the old brigade and the FYOP section commanders hand out the Canadian Military Colleges cap badge, which the Class of 2021 will wear on their headdress from here on out. This is a symbolic moment which represents their connection to anyone who has ever worn the distinct, silver badge. After the parade’s conclusion, the first years marched off and were once again allowed to leave the College and spend the rest of the day with their friends and families.